Do you prepare artichokes? Whats' is your favourite dish? 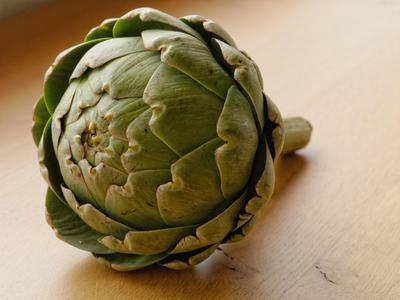 I've never cooked with fresh artichokes but use artichoke hearts that have been marinated in brine (you can buy them easily from your local supermarket). However, I'll always toss a few artichoke hearts onto an antipasto platter, or in a salad with beetroot or pair the hearts with a small Camembert cheese and walnuts with a little drizzle of honey. My mum cooks with fresh artichokes (it's fiddly) so she hasn't cooked them in ages. I do recall she would make a basic stuffing mixture with breadcrumbs, garlic, basil, oregano and salt and would stuff each leaf of the artichoke. She would bake or roast the stuffed artichokes in a little oil and water in the oven. They were absolutely delicious and we would scrape the stuffing and artichoke flesh off each leaf with our teeth until we eventually reached the heart of the artichoke. I have never prepared artichokes but have eaten them. They are rather nice, like bamboo shoots. I've actually never seen any in real life? No, we have never tried artichokes. I have never cook with artichokes. Just plain can't eat them! Should a woman pay spousal support to her ex-husband? Do you ever party all night?